Windows 7 and Windows Vista have a feature that makes user easier to association file extensions, file types and protocols with a particular program, that’s “Set Default Programs”, where the program showed in the menu list can be set as the default for all its supported and can open file extensions and protocols, or to selectively associate some of the file types and protocols to open with the programs from list of supported file types and protocols instead of full huge list of all file extensions and protocols. However, not all programs will be listed and configurable via “Set Default Programs” control panel. Only some Windows Vista-aware applications, such as Firefox, QuickTime, Safari, Windows Media Player and etc have added themselves to the default programs list with corresponding supported file extensions and protocols. Most program opts to let user associate file extension associations from within the program, or right after installation, which may subject to failure or error while changing file type associations due to limited account restriction. 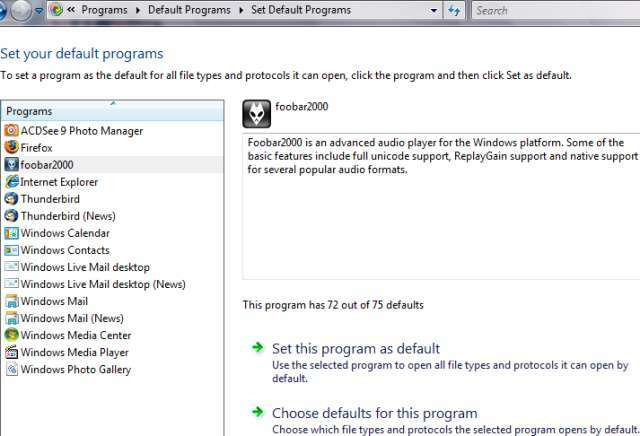 For user who wants to have foobar2000, a popular advanced audio music player for the Windows platform, to be displayed as an entry in the Default Programs folder, simply copy and paste the following registration entries file text, done by ManuelCalavera in Hydrogenaudio forum into a text editor, such as Notepad, and then save the file with any file name with extension .reg. Alternatively, simply download the fb2k_default_prog.reg (extracted from the ZIP format archive) (no longer available). 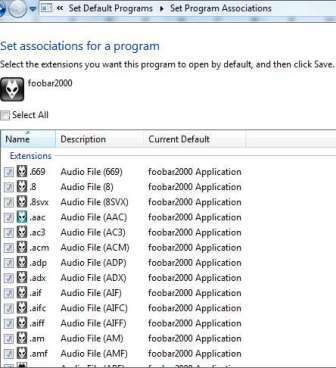 Then, execute, run or double click the .reg file to install and merge the registry entries into the system to get foobar2000 listed in Default Programs menu. Important: The following registry code assumes the foobar2000 is installed in C:\Program Files\foobar2000\ folder, which is the default installation path. If foobar2000 is not installed in this directory, change the registry entries file accordingly. The foolbar2000 registered in the registry has 30 associated file types, extensions or protocols, namely .svx, .8svx, .aiff, .aif, .aifc, .au, .snd, .cda, .cue, .flac, .fla, .iff, .mp4, .m4a, .mp1, .mp2, .mp3, .mpp, .mp+, .mpc, .ogg, .pls, .m3u, .m3u8, .fpl, .aac, .spx, .wav, .wv and .wma. The registry entries, when merged, won’t automatically create all these file associations though, it just create a menu entry in Set Default Programs menu for foobar 2000, and user can associate all listed extensions with fb2k at one click by clicking on Set this program as default, or manually select which out of the 30 extensions to associate with foobar2000 by clicking Choose defaults for this program. @="MPEG layer 1 Format Sound"
"FriendlyTypeName"="MPEG layer 1 Format Sound"
@="MPEG layer 2 Format Sound"
"FriendlyTypeName"="MPEG layer 2 Format Sound"
@="MPEG layer 3 Format Sound"
"FriendlyTypeName"="MPEG layer 3 Format Sound"
@="Ogg Format Sound (Speex, Vorbis, FLAC)"
"FriendlyTypeName"="Ogg Format Sound (Speex, Vorbis, FLAC)"
"ApplicationDescription"="Foobar2000 is an advanced audio player for the Windows platform. Some of the basic features include full unicode support, ReplayGain support and native support for several popular audio formats."